Pregnancy acne is not a special form of acne. You probably already know this: They are typically smallish, reddish bumps – sometimes they are white and pus filled. Acne during pregnancy is quite common. Many of pregnant women get pregnancy zits. Acne in pregnancy can be mild, moderate, and even severe or make existing adult acne worse. It can trigger any time during pregnancy. It may come and go, or it may last the whole pregnancy, so you never know. It is not always clear what causes acne during pregnancy, but higher production of hormones called androgens are at least partly responsible for acne pregnancy because they cause the sebaceous glands in your skin to become bigger leading to overproduction of an oily substance known as sebum. This surplus sebum, when combined with the dead skin cells, dirt and grime clogs your skin pores and creates conditions that are perfect for bacteria to thrive on. All this in due course results into inflammation and triggering of pimples during pregnancy and causes nasty bumps. Yikes! Pregnancy Acne Treatment can be complex. As a matter of fact, various over-the-counter treatments come with high risk of birth defects. In general you should never go for any medication, which you don’t need absolutely while you are pregnant even if that has a far-off possibility of harming your baby. Here is information on breakouts during pregnancy so as to help-keep you and your unborn baby safe. How To Treat Pregnancy Acne And Pimples? Pregnancy pimples or acne is a natural, cosmetic condition. In due course it recedes when hormone levels go back to normal. Thus the prudent thing to do is to steer clear of any prescription acne medications or over-the-counter chemical spot treatments. Instead you can count on drug-free home remedies. To be on safer side when you are pregnant or planning to be pregnant, talk to your doctor to find out what’s safest and best for you!! Pregnancy acne is a natural condition, so the safest course is to go for natural acne treatments during pregnancy, which are drug-free. Your best offense is a good defense – taking good care of your skin during pregnancy. (i) Clean your face gently with a mild, oil-free, alcohol- free, soap-free, and non-abrasive cleanser two times a day, once in the morning and once at night and especially after heavy sweating. Make sure to wash and rinse completely with lukewarm water, especially around your hair-line and jaw, where skin pores tend to get blocked. Pat dry your skin rather than rubbing it. (ii) Apply an oil-free moisturizer. Applying an oil-free moisturizer can actually help to decrease the irritation, since sometimes skin that’s overly-dried by harsh acne soaps is more prone to breakouts. (iii) Avoid over-washing or getting over aggressive with scrub, not only because you probably have extra sensitive skin during pregnancy, but also as over-cleansing washes away your skin’s natural moisture that in turn over stimulate the skin’s oil glands to replenish what you’ve removed, causing it more prone to acne breakouts. (iv) Never scrub your face with a washcloth as that can irritate your skin and make the pimples problem worse. Instead, use your hands gently to wash your face. (v) Shampoo your hair regularly, especially if it’s oily. Avoid oily hair mousse or pomade near the hairline. Also keep your pillow-covers, towels and any hats that you wear always clean. (vi) Never squeeze, rub, or pop pimples or try to scrub zits away. This usually aggravates the problem and can make your zits last longer and lead to permanent scarring. (vii) If you use cosmetics, use water-based products rather than oil-based, and look for descriptions such as “noncomedogenic” or “nonacnegenic,” on the product-labels. Such products will not block your pores and cause break-outs. Also make sure to wash off all your make-up before you go to your bed at night. (viii) Cutting out (or just cutting back on) sugar and refined grains (go for whole grains instead) can do miracles for your skin. Also, do away with unhealthy fats (aka saturated fats found in fried and various baked foods) as they can trigger acne. So, instead use skin-friendly healthy fats such as avocado, salmon, walnuts, almonds, and other skin friendly foods such as colorful fresh fruits and vegetables. (ix) Drink plenty of water to flush out toxins from your skin and for keeping it moist and clearer. Beyond natural home remedies and self-care, you may perhaps consider medication as an acne treatment during pregnancy. But be aware that any medication, which is either applied onto your skin or swallowed, can go into your blood stream and affect your baby. So, you need to exercise utmost caution when having acne while pregnant – even with over-the-counter acne treatments. If your acne or pimples are really bothering you, talk to your doctor. He or she can advise what topical pregnancy acne treatments are safe for you to use. They may recommend benzoyl peroxide or azelaic acid (an antibacterial cream available only by prescription). You may also consider using creams that contain erythromycin or other antibiotics – only when they are approved by your doctor. 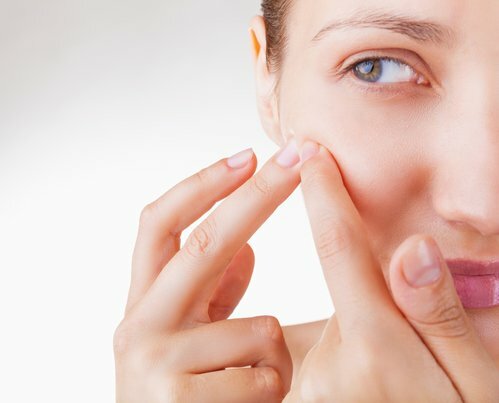 Glycolic acid and exfoliating scrubs are also perhaps safe to use, but you are advised not to use any medication – whether topical or oral – unless and until it has been prescribed or cleared by your doctor, who is aware of the fact that you are pregnant or trying to conceive, as the case may be. Keep in mind that the pregnancy acne is not bad for your skin! While you may have to bear with some acne or blemishes, however – as you circulate more blood and retain more water you may find that your complexion is more radiant than ever before! !